This illustration created by Akihiko Ikeshita and received from Japan Aerospace Exploration Agency (JAXA) on December 7, shows an artists impression of The Planet-C Venus Climate Orbiter, nicknamed "Akatsuki" or "Dawn", orbitting Venus. Last week the probe narrowly missed its entry point to the orbit of Venus, where it had been due to observe the toxic atmosphere for two years. Despite its shoestring budget, Japan's space programme has boldly reached for the stars, pioneering solar-powered galactic travel, exploring a distant asteroid and planning a robot base on the Moon. The past year has seen Japan's space agency JAXA chalk up several world firsts, including the safe return of a deep-space probe that picked up asteroid dust from a potato-shaped space rock on an epic seven-year odyssey. 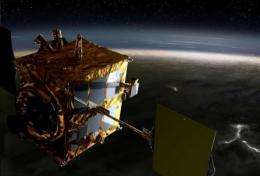 The Hayabusa (Falcon) ended its five-billion-kilometre (three-billion-mile) mission when it burnt up on re-entry over the Australian outback. Hayabusa had already safely parachuted to Earth a disk-shaped container with the particles inside. Because asteroids are thought to date back to the dawn of our solar system, it is hoped the extra-terrestrial grains from asteroid Itokawa can help reveal secrets from as long as 4.6 billion years ago. The Hayabusa mission -- costing less than 200 yen (two dollars) per Japanese citizen over 10 years (20 billion yen) -- has boosted interest in the space programme, and in science and technology, said project leader Junichiro Kawaguchi. "Space development doesn't foster industries directly but it can nurture people who will contribute to industries in the future," he said. "It brought about an immensely bigger educational effect." Earlier this year the Japan Aerospace Exploration Agency (JAXA) also stunned earthlings everywhere when it sent a "space yacht" floating through the black void, without leaving a hint of a carbon footprint. 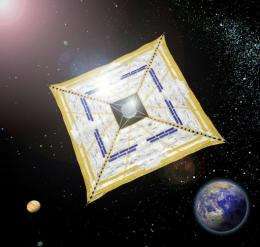 The kite-shaped Ikaros -- short for Interplanetary Kite-craft Accelerated by Radiation of the Sun -- is propelled forward by sun particles bouncing off its fold-out wings, which are thinner than a human hair. There have been set-backs too. Last week the Akatsuki (Dawn) probe narrowly missed its entry point to the orbit of Venus, where it had been due to observe the toxic atmosphere and blistering volcanic surface for two years. 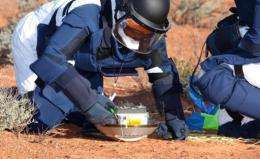 This photo, taken in June and released by the Japan Aerospace Exploration Agency (JAXA) shows JAXA personnel inspecting the capsule carried by the Japanese Hayabusa spacecraft after it parachuted back to land in the Woomera military zone in the Australian Outback. Despite its shoestring budget, Japan's space programme boldly reached for the stars this past year. Ground control put on a brave face after the mishap, vowing to try again when the probe and Venus have their next rendezvous in six years. If Akatsuki makes it, it will get a close-up glimpse of what is often called our sister planet -- similar in size and age to Earth but shrouded in sulphuric acid clouds and baking at 460 degrees Celsius (860 degrees Fahrenheit). JAXA's mission are far more ambitious than its budget would suggest. The agency has no manned missions and operated on 339 billion yen (four billion dollars) this fiscal year -- less than one-tenth of the NASA budget, and less than half the annual cost of Europe's space programme. This image released by the Japan Aerospace Exploration Agency (JAXA) in April, shows an artists impression of what the Japanese satellite Ikaros might look like in space. Despite its shoestring budget, Japan's space programme has boldly reached for the stars, pioneering solar-powered galactic travel, exploring a distant asteroid and planning a robot base on the Moon. An expert panel advising the minister for space development has called for sending a wheeled robot to the Moon in five years -- having first considered a two-legged humanoid, which was rejected because of the Moon's bumpy surface. It envisions building the first lunar base by 2020, which could be staffed by advanced robots, as a key stepping stone for Japan's space exploration, a field where Asian competition is heating up. "It is extremely important to probe the Moon... as we now see the dawn of 'the Age of Great Voyages' in the solar system," the panel said, pointing out that "China, India and other countries are aiming to probe the Moon." The government's Strategic Headquarters for Space Policy believes a successful space programme does much to lift Japan's profile on Earth. "Our country's space technology, its achievements and human resources are truly diplomatic resources that would boost our influence and position in the international community," it said in a policy report. Four billion is not one tenth the NASA budget, which is around 18 Billion. ...envisions building the first lunar base by 2020, which could be staffed by advanced robots, as a key stepping stone for Japan's space exploration, a field where Asian competition is heating up. This makes me sick to my stomache. Every time I mention something like this on this forum, FBM or some other dumbass says it would cost too much or be too hard, or take millenia, and here Japan is actively planning this within 10 years. When exactly did it happen that nearly everyone in America and Europe, including the allegedly "smart" ones, became too stupid and lazy to bother even considering something more complicated than their next fast food meal? yeah, sure this stuff is hard to do. It's not impossible. We landed there 41 years ago with a pocket calculator's worth of computer power and some magnetic tape controlling the craft. didn't they just overshoot venus and throw away 300 million bucks? maybe more? Russia just had a mishap too, and they spend far, far more money. There vehicles didn't even get into space. Japan's probe over-shot partly because something malfunctioned in the computer, causing it to shut down and go into safe mode, so correctiosn to trajectory were not made when they were supposed to be made. But the good thing about un-manned exploration is that when things like this happen, nobody gets killed. You try again and learn from your mistakes, but at least nobody is missing mom/dad/brother/sister/husband/wife. Good to know they aren't polluting the atmosphere up in SPACE. I guess they launched the space craft using a rocket powered by baking soda and vinegar? Oh wait, that reaction gives off carbon too, doesn't it. Maybe rubber band propellers then? Why do they use comments like that? That's just silly. This is getting really picky, but using the word 'yacht' is not technically correct either, but I guess they mean sailboat. It is also not one hundredth the NASA budget, but we're moving in the wrong direction.